STOP SMOKING: KICK THE HABIT, ONCE AND FOR ALL! There are an estimated 7 million current smokers in Britain today, and 15 million former smokers who have successfully stopped smoking. That’s not to say the process is easy – many people quit smoking and then relapse multiple times, before managing to quit for good. As more and more public education is delivered, the number of people who successfully quit smoking is steadily rising. In 2015, over a million people used an e-cigarette to help them to quit smoking, around 700,000 used a nicotine replacement aid such as patches or chewing gum. Similarly, in 2015 around 350,000 people were supported in their attempt to quit by their local stop smoking service. The smoking rate and number of cigarettes sold across Britain is also at an all-time low, reflecting the public’s increasing awareness of the benefits of quitting smoking. It’s been over 50 years since evidence began to emerge, regarding the strong link between smoking and lung cancer. The health risks are undeniable, so instead, we’re focusing on the positives: things to look forward to when you reach your smoke-free goal. 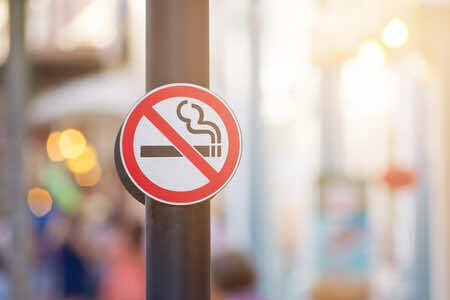 Quitting smoking will not just improve your overall health, but drastically cut your chances of developing many nasty diseases associated with smoking. 1 in 2 smokers will die from a tobacco-related disease. Quitting smoking will help you and your family enjoy a better quality of life, and be fitter and healthier. To be a better role model to your children, or other family members. Children of parents who smoke are more likely to develop the habit themselves in future. 3) To Have More Money in Your Pocket! Smoking is an expensive habit! The average 20-pack of cigarettes cost of approximately £10, so if you’re smoking 20 a day that’s a £70-a-week habit! At this rate, imagine how much you could save a month – or even a year – by cutting down or quitting? Quitting smoking will mean you’ll have fresher breath, and your clothes won’t smell of smoke. That’s not to mention the positive effect it will have on your skin, hair, teeth and nails. Some people use smoking to cope with life’s many stresses: quitting smoking will allow you to tackle them head-on, without resorting to this unhelpful coping mechanism. If you think your smoking is due to stress, have you considered talking to GP about this? With a doctor, you can find a better way of coping with such stress. We can easily see and appreciate that the benefits of giving up smoking are many and varied, but what do we do when we have been smoking for many years, or have tried and failed to stop smoking in the past? It can be disheartening if you have been unsuccessful in stopping smoking in the past, but 2017 is a great time to try again! Trust us, quitting smoking is possible. Breaking the habit is possible and will leave your feeling much healthier! I Want To Stop Smoking: Where Do I Start? A visit to your local GP is a great place to start. Your GP can act as a source of advice and support if you want to talk about quitting, or even think about setting a date, and your Doctor can also discuss your options for quitting with you, be it willpower, nicotine replacement aids, or using your local quit service. And remember, you are four times more likely to quit with support from a professional! Many patients also worry about gaining weight when giving up smoking, and this is also something that can be discussed with your GP should you be concerned. If you need any more information, why not book in for a private doctor appointment at London Doctors Clinic? We offer a wide range of GP services, and have a number of clinics across central London, so you should never have to travel far when you’re in search of a “GP near me“!